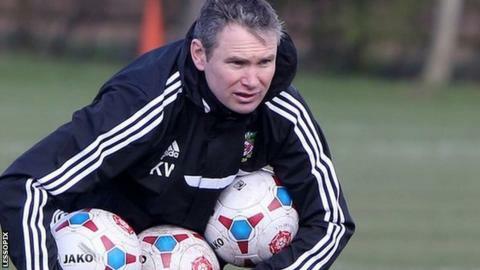 Wrexham manager Kevin Wilkin believes he has the players capable of scoring the goals to bring success in the Conference. The Dragons moved to seventh in the table after their 1-0 win over Forest Green Rovers, with Louis Moult scoring for the fourth time in five matches. Last season Johnny Hunt was their top scorer with 11 goals. "Hopefully we can on and score enough goals as a group to make us successful," said Wilkin. "Strikers are the difference between winning and losing and we've got two fantastic strikers in Louis and Connor [Jennings] who give us a real spearhead in what we try and be about." Mount's superb second-half free-kick earned Wilkin's team their third successive away win in the league. It also saw him continue to repay the faith Wilkin showed in the player he bought from Nuneaton - where he was manager before joining Wrexham. "I know he's capable, but I need to keep him up to his work. I need to keep his feet grounded," added Wilkin. "Conor's more than capable as well, Wes [York] is capable as well and Johnny Hunt's proved he can score more than a dozen goals in a season - some of the midfielders can weigh-in as well. "Bish [Andy Bishop] is there and waiting in the wings and he's a capable striker too, so hopefully if two or three of them are getting into 20 goals I'll be delighted." Wrexham will be aiming to continue their run of good form against 15th-placed Bristol Rovers at the Memorial Ground on Tuesday.